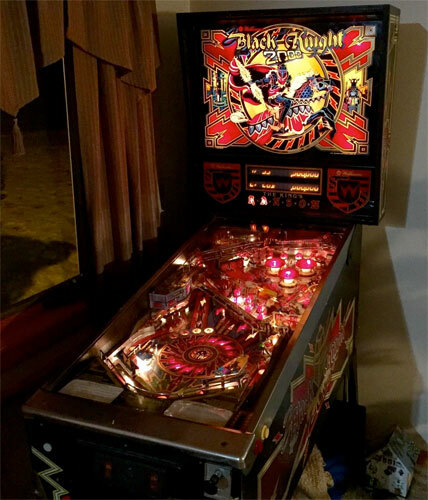 Check out these Black Knight Pinball Machines For Sale by Williams. You will also find parts and accessories including the Ramps, Flyer, Sound Board, Flipper Rebuild Kit, Fuse Kit, CPU Rom Chip Set, Translite, Playfield Plastics, Target Set, Mods, Keychains, and Custom Target Decals. The first game with the groovy Magna-Save function, two-level playing field, and faceted inserts in the playfield. Magna-Save is a feature where a peep could press a button on either side and magnets would stop the ball from sinking via that outlane. The Black Knight will slay you! I cannot fight you, you win.